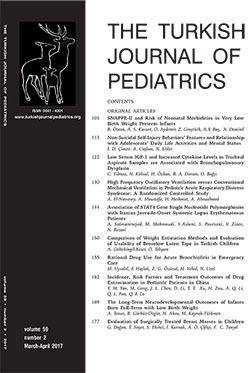 1 Division of Pediatric Emergency Medicine, Department of Pediatrics, Hacettepe University Faculty of Medicine, Ankara, Turkey DOI : 10.24953/turkjped.2017.02.006 Gültekingil-Keser A, Tekşam Ö. Comparison of weight estimation methods and evaluation of usability of Broselow Luten tape in Turkish children. Turk J Pediatr 2017; 59: 150-154.